I have all next week off from work. I will have the house to myself and have only two things on my to-do list. Work on the new blog. When I say “new blog” that’s a bit of a misnomer since I’ll actually be importing all my old posts to the new site, but I will be setting up a newly-designed and newly-named blog on a new domain. I’m doing all the work myself and at this point I really don’t know if that was a good idea. I figure at least for the initial roll-out whatever I manage to pull together will have to do. Also, I do like the notion of having complete creative control throughout every step of the process. I’m funny like that. The decision to move in a new direction came about last fall when Autumn started having problems in school. Normally I wouldn’t think twice about sorting through my parenting challenges by writing about them here. I’ve found the best support here as I’ve written through my daughter’s infancy and on to her first day of kindergarten. And as I’ve said before, there comes a point in your child’s life when you have to embrace the idea that her stories are not your stories, and although you did have a hand in creating her, you eventually have to let her weave her own narrative as she will. Right now that entails lots and lots of crayon drawings of various members of our family, including the dog. She’s a great storyteller, though, and might someday start pounding at the keyboard like her mom. For now her audience is very, very small and I’m happy to keep it that way. That being said, the new blog is not going to differ much from what you’ve been seeing here lately; posts about weight and weight loss and freakouts about the same. A year ago I was very hesitant about documenting my efforts to drop the weight. There’s so much more to me than being fat and I wasn’t sure I wanted to become a weight loss blogger. I was happy writing about anything and everything in my own little niche-less space, but as I continue to grow (or shrink, rather) as a person, the blog grows, too. I am not the same person I was two years ago, so of course it follows that the blog should evolve with me. At this point I don’t anticipate being able to unveil the new blog by the end of next week, but I do hope to complete the hardest part- design and layout. I’ve already changed my Twitter name and will be creating a new Facebook page. Since I don’t want anyone peeking while I work on setting up my new digs, I won’t be revealing the name of the blog until I’m ready to go live with it. I just wanted to let you all know there will be changes. HEADS UP! BLOG WILL BE CHANGING SOON. KTXBAI. Five years ago today I published the first post on this blog. Back then I was a mom-to-be waiting for the birth of my daughter. Now, as you well know, that daughter is now a kindergartener. Nathan and I recently cleaned out the kindergartener’s bedroom. It was in dire need of a purge and we spent an entire Sunday afternoon filling a thirty gallon trash bag with things we probably would not have been able to throw away had Autumn not been watching a movie downstairs. 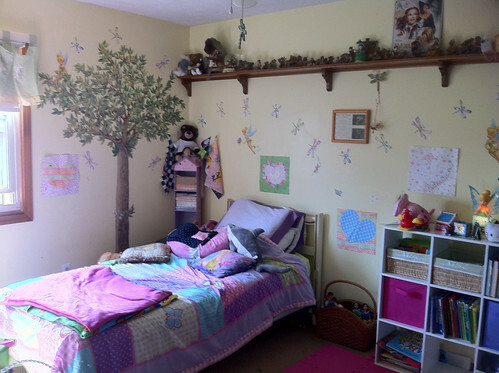 When we were done, Autumn walked into her newly cleaned space and exclaimed, “Thank you for my new, room!” She thought what we had done was amazing and continued to thank us for days afterwards. It made us feel good knowing she appreciated our efforts, but I wasn’t sure how long Autumn was going to be able to maintain her clean quarters. She is my kid, after all, and my mother could tell you a story about how she tried to navigate through the mess in my room once and wound up squishing an unopened chocolate pudding cup into the carpet. And, um, I think I may have been a teenager at the time. Last Tuesday I decided to take some pictures. The room was still clean so I pulled out my iPhone and started snapping away. As I took one picture after another, it occurred to me that I was repeating a process I performed exactly five years ago when I documented the state of Autumn’s finished nursery for my very first post here. To celebrate my blogversary, I wanted to post the pictures for you, both the ones I took last week and the ones I took five years ago. I thought it would be cool to see how the room has changed over the years and how some of it has stayed the same. All the furniture is new and the walls are freshly painted. I did it all, yo. 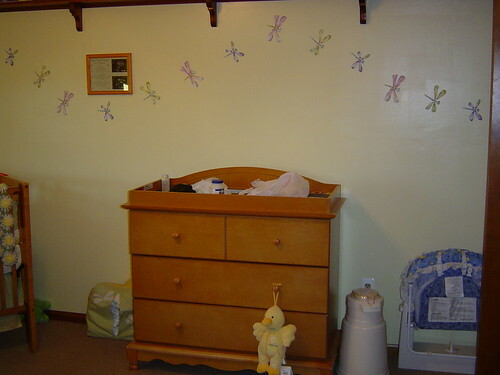 The paint, the furniture assembly and the dragonflies were all me. Nathan helped with the tree, but I’m very proud to say this room was what it was because of me. The tree is still there, the dragonflies are still flying towards the closet and the framed ultrasound is hanging in the same place as in the previous picture. But this is not a baby’s room anymore. In place of the crib is a bed, my bed from when I was a kid. 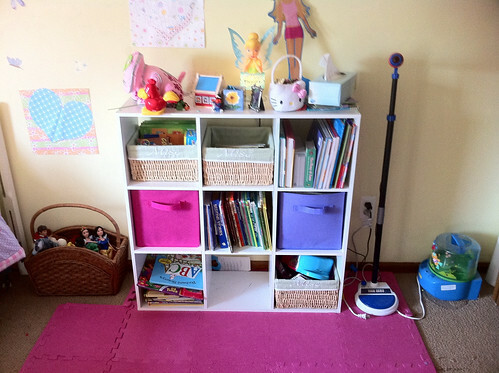 …has made way for cubed storage that holds most of Autumn’s books. 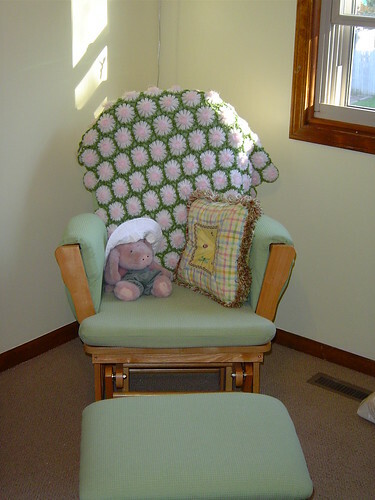 We still have the rocking chair, but it is no longer used for nursing. It sits out in our living room, a stained and mismatched remnant I can’t bear to part with since it’s the only piece of nursery furniture we haven’t sold. Don’t even ask me what happened to the pig. I have no idea. 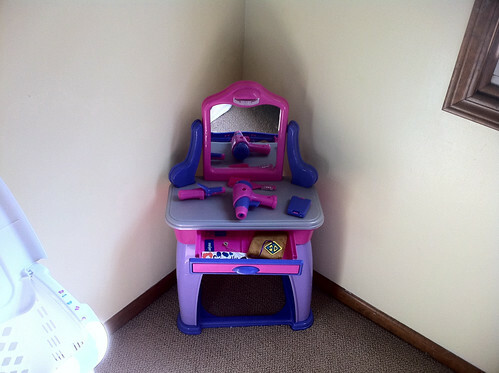 In this same corner we now have a little vanity where Autumn applies the sparkly lip gloss my mother bought for her. 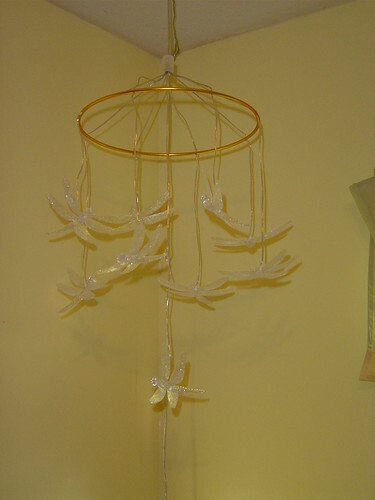 Above the rocking chair hung the lighted Ikea dragonfly mobile. 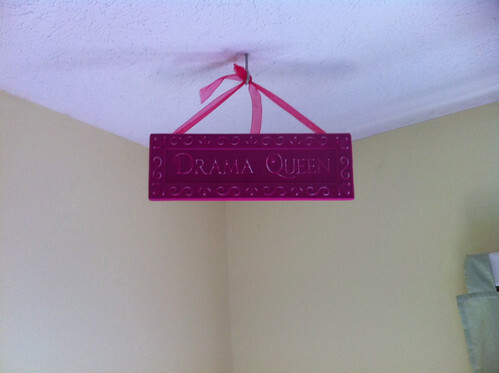 Autumn asked me to take the thing down about a year ago. It gave off a soft, yellow light that lit up the room without being too overpowering. When Autumn was an infant and I was still nursing, it provided just enough light to help me see what I was doing. The armoire, the edge of which you can see in the first picture, was the one piece of furniture we could have done without. It held blankets that we never used and that could have been stored in the closet. This dresser, however is very useful. 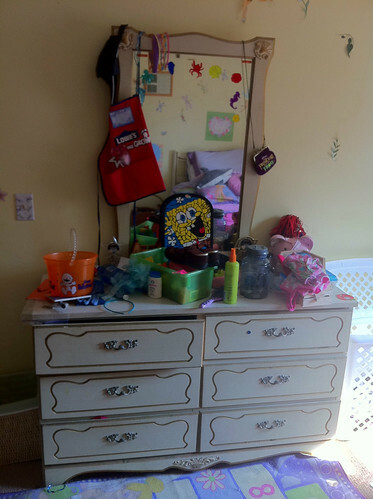 This was my mother’s dresser. Then it was mine. Now it is Autumn’s. It’s also cluttered with stuff, but hey, we’re not perfect. 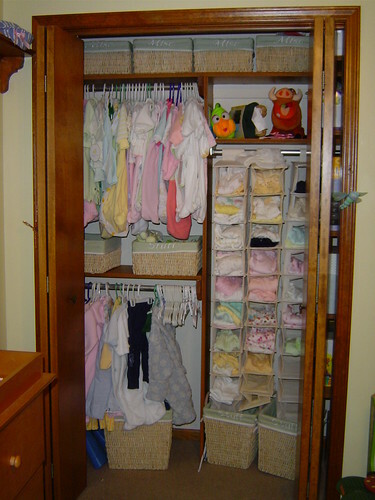 Speaking of stuff, remember the closet? I was quite proud of this closet. It was full but organized, and whenever I look at this picture I am reminded of how blessed I was to have had such generous friends and family. No more onsies, sleepers or footie pajamas. 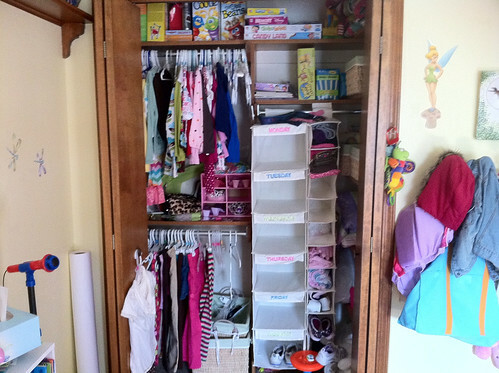 Big girl clothes and big girl shoes and boxes of big girl games have taken over and all signs that a baby ever lived here have disappeared. These past five years have gone by so fast. They’ve also been amazing. Like my daughter, this blog has helped me grow in ways I would never have expected. I’ve made some wonderful friends through it and have been able to awaken a creative side of me that had been dormant since finishing college. When I published that first post five years ago, it never occurred to me that I’d still be doing this five years later. I’m glad I was able to surprise myself. Way existential. Like Ren and Stimpy. Last week I signed up to go to the Type-A Mom Blogging Conference. I wasn’t planning on going to another conference this year. In fact, a conference that caters specifically to moms was way off my radar. I was very happy with my experience at Gleek Retreat and I didn’t find myself really down about missing BlogHer last month. Also, conferences are expensive, and while I did just write my very last check for child care (yay for full day kindergarten! ), I feel a little guilty spending the money on a trip I’m not sharing with my family. The thing is, I want to do more with this blog but I’ve been struggling with some self-imposed rules that really matter to no one but me. They’re silly rules, but they tend to dictate the content of this blog because I don’t want to jeopardize the authenticity of the voice I’ve created or lose the audience I’ve gained so far. But y’all, something has to give. Today Feedburner tells me I have 89 subscribers. Seven people visited my site yesterday. The Google bot is probably the most influential visitor in keeping my bounce rate down. Oh, and I’ve been doing this for FIVE YEARS. I’m not usually one to complain about my lack of traffic, and I wouldn’t say that is what this is. What I am saying is this blog has become a reflection of my real life. I’m kind of a homebody and an introvert. Remaining safely anonymous is preferable to taking the risk of putting myself out there and participating in something new. The lack of growth here mirrors the lack of growth in my professional life. For nine years I’ve worked in a job that is completely wrong for me because it offers a good paycheck and excellent benefits. And in this crappy economy I have no plans of leaving the job soon, but that doesn’t mean this space here has to remain the same. But I haven’t wanted to tinker because, you know, if it ain’t broke don’t try to fix it. I think it may be time to tinker, though. Tinkering might be good. Those of you who have been my regular readers over the years are awesome and I don’t want to discount your loyalty. Most of you are bloggers yourselves and I’ve gotten to know you very well. Some of you may even be going through these same identity issues, especially in light of how commercial the blogosphere has become (hey, did you know “blogosphere” pops up in spell check now?). There are very few bloggers out there now who open up shop wanting only to write and tell stories. Hell, even Dooce, who previously never used to write sponsored posts, is enjoying an entire office remodel courtesy of Verizon. So the blog world is a-changing. The good news is it’s always changing. I think every blog is in a constant state of flux, and the longer you stay out there and keep doing what you’re doing, the more you’ll see where the blog is meeting your needs, where it’s not and adjust accordingly. For me, the blog has exceeded my needs in that it has provided a creative outlet, a means of therapy and has brought me some wonderful relationships. In fact, that I’ve been able to keep it up this long is very unusual for me. I’m not known for staying with a project for an extended period of time. I get bored and frustrated. I lose confidence and tend to move on to something else that interests me, at least for a short while. That I’ve been able to keep this going for five years means that what I do here is very valuable and I can’t lose sight of what it is that keeps me coming back to tell my stories. But something is missing. I can’t exactly put my finger on it, but there’s a definite feeling that this blog is less than what it could be. I put what time I can into it, and until I am able to unshackle myself from the cubicle it’s going to have to remain something I do when I have the time to do it. The day I fly back from North Carolina will actually mark the fifth anniversary of my very first post here. 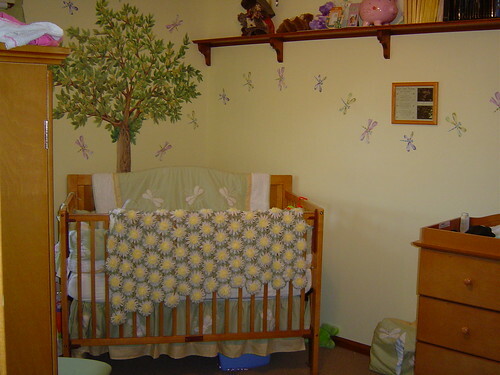 Yes, there are a few random posts I imported from a blog I very briefly maintained in 2004, but the site now known as “Autumn At Oak Hollow” started on September 27th, 2005 when I was 40 days away from becoming a mother. Well, it was actually 50 days since we went ten days past my due date. And now, since my daughter is about to begin a new phase of her life in kindergarten and beyond, I think it’s only appropriate that this blog also branch out in new directions. Hopefully, as I fly back home, I’ll have a clearer vision of the next five years. Maybe I’ll be inspired, but most of all I hope to be confident enough to explore new opportunities while keeping this site a place I love, a place you love and that keeps us all wanting to come back again and again. As always, I thank you for putting up with me. Autumn does not know I’m a writer. I could tell her I’m a writer, but she wouldn’t know what to do with that information. I could tell her I like to tell stories and she’d probably respond by lighting up and begging me to tell her a story right then, one that involved a princess or a monster or both. My father is a retired middle school science teacher. My mother currently works at a hardware store and spent most of my formative years working in a bank. Mom is the reader of the two, preferring biographies over anything else. My father spends his free time cataloging his extensive music collection and planning his annual trip out west. He keeps a journal during these trips, but the other 49 weeks of the year go undocumented. Both of my grandmothers have kept diaries at one time or another, though from what my uncle says about Grandma D.’s diary (he peeked), she uses it to discuss everyone else’s transgressions. Recently Grandma D. gave my dad a journal my grandpa kept during his time in the army. This was during World War II and the journal was mainly a log of departures and arrivals, names of transport vessels and one brief mention of a young woman who kept him company during a furlough. There was very little mention of getting sick and spending over a year in a malaria camp in Australia. As my dad read the journal aloud to us, I couldn’t help but think it was a rather mundane account of an extraordinary time in my grandpa’s life. A few days ago Autumn started carrying around a Post-It notepad and pen. She called it her notebook and I’d catch her scribbling in it from time to time. I told her she looked like a reporter. She had no idea what I was talking about. “Do you want a real notebook?” I asked and presented her with one of the many little Springpad notebooks I brought back from BlogHer last year. She now writes in that and rips the pages out to give to me or Nathan. The most recent note was given to the dog and was lovingly placed on Molly’s pillow in the living room. I had to take the notebook away from her last night. I found it in her bed along with her pen. “You need to sleep,” I said and placed the notebook and pen on her dresser. She was distraught but didn’t make any attempt to retrieve the notebook while I was in the room. This morning the notebook was still on the dresser, but several pages had been ripped out and were strewn across Autumn’s floor and bed. I picked one up and observed the random grouping of letters she had scribbled on the page. And finally it dawned on me that maybe I’m not the anomaly I thought I was after all. We all tell our own stories in our own way. Some people just tell them more often. I spent some time today clearing out the drafts of my unpublished posts. Some were posts that had been published and retracted, some never made it past the first sentence while others were complete posts that just needed a good title. I deleted most of the drafts today, republished some of the retracted posts and saved a few of the drafts to finish later. Of the stuff I did delete, I decided to save a few choice excerpts to publish here. “She became hysterical as Nathan and I stood there in shock. Every word was like knives being thrust into our hearts and yet we could do nothing more than stare dumbfounded as our child wept in the bathtub. As you can see, I’m all over the place with these, but I like to think they represent what this blog is all about. Life, humor, family, sadness and joy. And, of course, Die Hard. Do you care to share what’s in your slush pile? If so, leave a link to your post in the comments. Who knows? This could be fun. Gleek Retreat was awesome. It was my second blogging conference and it left me wanting more. There’s something to be said about doing things on a small scale. The setting was beautiful and intimate. There were about 40 people total who attended Saturday, fewer on Sunday since some had to go back home, but it was the perfect size. As with BlogHer last year, I didn’t take many photos. Of the photos I did take, a good number of them are of food. Seriously, I hovered around the kitchen a little too much. If you mosey on over to my Flickr stream you can click on my Gleek Retreat set and say hello to fruit, cheesecake and chocolate. I met a lot of bloggers, though I tended to hang with the ones I already knew. What can I say? I’m still a little bit of a wallflower. That’s why I like to have a camera hanging around my neck. It gives me a reason to approach people, though my pictures tell a different story. Food and nature, folks. That’s where it’s at. The sessions and panelists were amazing, and while I’d love to discuss each one, you’d probably be better served by skimming through the transcript our Gleek Retreat tweets. Wow, say that three times as fast as you can. I learned there are some things I am doing right and some things I could be doing better. I learned famous bloggers can be very gracious when you look at them and say, “Oh that’s why you look familiar.” I also learned that I’ve been living in a cave and the walls of that cave are covered in my own words. No one is going to find me if I don’t get out there and look for them. I would love nothing more than to be able to go to more conferences like this because the people I hung out with this weekend are my people. I have found my tribe and that’s better than any swag bag you can give me. Sill loved the swag, though. Jodi and Stacey did a fantastic job putting this thing together and are already talking about Gleek Retreat 2011.